This story does not start in Holland, but it does end there. In simplest terms, Tulips are from Central Asia. And Daffodils are from Spain and Portugal. Certainly, few flowers have been more intensely “worked on” than these. Many bulb flowers, now all developed, produced, and exported from Holland, are native to other far-flung corners of the earth. In fact, Holland is no bulb’s ancestral home. Wild Dahlias come from Mexico. Amaryllis is native to South America. Freesias and Callas come from South Africa. And most of the species or “wild” lilies are from China, Japan, and North America. It’s important to understand that many of the original wild forms of these famous flowers look nothing like the garden flowers that mostly Dutch hybridizers have created from them. It’s a fascinating story, unknown by most wildflower enthusiasts. Most of the true “wild” forms of these bulbs are still available, but with all the clamor and glamour of the hybrids, the wild ones are sometimes hard to find. During the 1500s, early botanical drawings in Europe fueled the fire of interest in the tulip which eventually resulted in the notorious Dutch financial panic known as “Tulipomania”. During the 1500’s, Europeans became plant explorers, and began recording their findings. Beautiful botanical drawings of tulips began appearing in Europe, so beautiful, in fact, that they gained wide notice. One botanical rendering in particular, called Tulipa bononiensis, became very famous. Others showed the “flamed” tulips that were very exotic to the Europeans, and interest in these “new flowers” continued to grow. These were the multicolored blooms that today are called “Rembrandt” tulips, even though the famous Dutch painter never painted flowers. Other great Dutch painters did. The main flow of the tulip story in Holland actually begins with a botanist named Carolus Clusius, working at the University of Leiden. He had worked in Prague and Vienna, mostly with medicinal herbs. But in 1593, he was appointed “Hortulanus”, the contemporary title for head botanist, at the University of Leiden’s now famous “Hortus”, the first botanical garden in Western Europe. However, his “tulip connection” actually began during his earlier projects in Vienna. There, Clusius had met a man called De Busbecq who was the ambassador to the court of the Sultan Suleiman in Constantinople, the seat of the Ottoman Empire. DeBusbecq gave Clusius some tulip bulbs from Central Asia, and he brought those bulbs with him to Holland. The rest, literally, is history. Once a few bulbs got beyond the protective grasp of Clusius, they were considered very precious rarities. As a trade in the bulbs began, the prices began to rise. Through the early 1600’s the prices skyrocketed as an actual trading market developed. As the hybrids became more and more glamorous, the limited supply of certain bulbs became highly prized by the rich, who ultimately, were willing to pay almost any price. By 1624, one tulip type, with only 12 bulbs available, was selling for 3000 guilders per bulb, the equivalent of about $1500 today. (Imagine…and you can have a very similar “Rembrandt” tulip bulb now for about 50 cents!) Just a short time later, one famous sale is recorded for a single bulb going for the equivalent of $2250 plus a horse and carriage! It was an incredible bubble, and it was about to burst. During the 1630s, the frenzy continued as notarized bills of sale were being issued for bulbs, fraud and speculation were rampant, and what always happens with financial “bubbles” happened. The crash came in 1637. Many rich traders became paupers overnight, and the prices finally settled at a much more practical level. Of course, all this did not reduce the real demand, the love of the sheer beauty of the flowers. So ever since those days, the enterprising Dutch have built one of the best organized production and export businesses in the world. 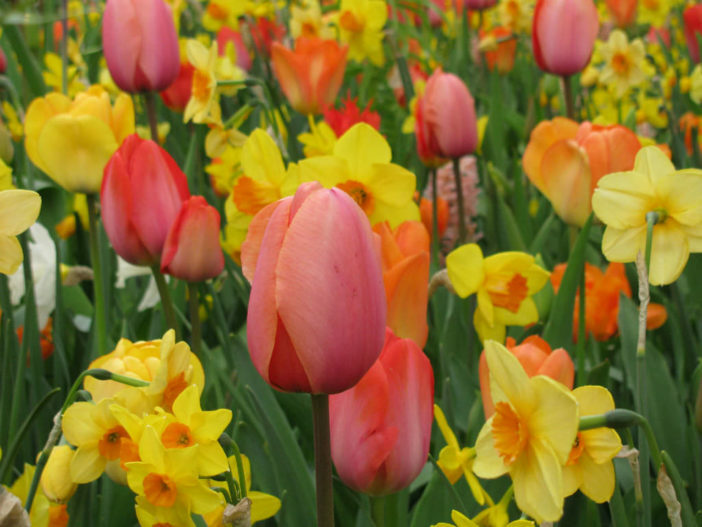 Today, over nine billion flower bulbs are produced each year in Holland, and about 7 billion of them are exported, for an export value of three quarters of a billion dollars. According to the Netherlands Flower Bulb Information Center, the USA is the biggest importer of Dutch bulbs, and in a recent year, $130,000,000 worth of Dutch bulbs (at wholesale) were imported. Daffodil, Narcissus, Jonquil. First, let’s settle the names. The official botanical name of the whole genus is Narcissus. Daffodil is the common name. Jonquil is a “species name” within the Narcissus genus. This means that certain daffodils are called Narcissus jonquilla. Some people, particularly in our Southern states, use Jonquil as a common name for the whole genus, but it’s really the species name for a minor group having multiple smaller flowers on each stem. So when you’re using the common name, all colors, sizes and types are Daffodils. If you get into the botanical or Latin names, they all begin with Narcissus (the “genus”) and end with a different “species” name. The famous Poet’s Daffodil , for example, is Narcissus poeticus. It has that name simply because Linneaus, the man who devised our botanical nomenclature, decided that a certain wild species (white petals with a small bright-colored center) was the one that inspired the ancient tale of Narcissus, handed down by the poets since ancient Greek times. Jonquil? And as mentioned, a small, multi-flowered yellow daffodil type is botanically Narcissus jonquilla. Of course, you don’t need to know the botanical names to enjoy daffodils. Just choose the colors and types you like. But the story of Narcissus is interesting. Incredibly, this remarkable wildflower is alive and well in the Ukraine. In fact, they have a preserve there called “The Valley of the Narcissi.” where over 600 acres of these magnificent flowers bloom each spring.